As we move into the American League portion of these previews, I'm going to try and keep the entry for each team a bit shorter as it's taking me far too long to assemble these previews and I want to have it all completed before Opening Day which is...tomorrow! Baseball's only four-team division looks like it'll be a three-team race this year. Oakland has brought in a bunch of bats, Texas is a new powerhouse, and the Angels won't stay down for long. The Mariners look terrible once again. This is my favorite American League team and I've been picking them to win the AL West each year for a while now. They haven't won it since 2006 which was also the last time they played in the postseason. But the team has now established a(nother) strong trio of young front-end starters in Brett Anderson-Trevor Cahill-Gio Gonzalez. The team finished at exactly .500 last year, 81-81, with an anemic lineup and uncharacteristically shaky bullpen. They've completely revamped the lineup, adding three hitters who jump right into the 3-4-5 slots and pushing guys like Kurt Suzuki and Kevin Kouzamanoff down to the bottom of the order. Daric Barton established himself as an on-base machine (.393 OBP last year) atop the lineup and I think the overall result will be better run-production than the A's have had in many years. The pitching looks to be strong again with a loaded bullpen and as long as they have the Ellis-Pennington combo at 2B/SS and Coco Crisp (if he's healthy) manning centerfield, this is a great defensive team. I've got them pegged for a big year, 87 wins and a playoff appearance. The defending American League champs look strong once again this year. Adding Adrian Beltre to that lineup (as well as his superb defense in the field) will be a major boost to them. While this is an organization that looks to be prepared to compete for years to come, I think we'll see a tiny bit of regression from their 90 wins last season. Their pitching staff was outstanding last season, particularly the bullpen. If the two best starters, C.J. Wilson and Colby Lewis, can match their excellence from last year, this team will be great again but I expect them both to fall back down to earth a bit. Same with the bullpen; while Neftali Feliz is an unquestionably superb pitcher, saving him only for the 9th inning and textbook "save situations" is a terrible waste of resources. Like every other Angels fan I am disappointed that they blew their money on paying off the rest of Vernon Wells' contract rather than overpaying for Carl Crawford. The fact that Boston chose Crawford out of all the big free agents of the last few years to really go overboard on should tell you that he was the guy to get. But as far as 2011 goes, I feel the Angels have the widest degree of possible outcomes of any team out there. They might win 90 games or they might only win 72. Neither would surprise me. The key may be Peter Bourjos. He is another monster defensive centerfielder in the Gary Pettis and Devon White tradition. With him running down everything in sight out there (giving the Angels a full season of improved defensive efficiency %) and if the Angels deep farm system burps up a couple of talents a little early, they could receive a big boost. If Wells has one of his sporadic good years, and if Mike Scioscia can work his magic again where the Angels exceed the expected Pythagorean wins and then they use their money to take overpaid talent off the hands of some teams having disappointing seasons, then bam: 90+ wins. I also expect the Rangers to regress (and Seattle to improve) based on the Plexiglass Principle. The A’s are just too poor and every free agent that Billy Beane signs never seems to work out. So the division is there for the taking. But if the Angels' old players suddenly decline like old players do, and they get a couple of key injuries, some pitchers disappoint and they start slow, then they’ll stink. My own guess for this group is right in the middle of that huge variance of possible outcomes John speaks of. I say 83 wins. It seems like they can't possibly be as horrifically bad as last year. As shown in Baseball Prospectus 2011, they put up one of the 15 worst offensive seasons since 1954 last season (as measured by True Average). Things can only get better, right? Well, the team didn't really do much to improve the offense during the offseason. They brought in Jack Cust (a Three True Outcomes favorite of mine but not a reliable hitter) to be their designated hitter and catcher Miguel Olivo who, for his career, has an OPS+ of 86, sixteen percent below the league average. On the other hand, it is reasonable to expect that hitters like Chone Figgins and Franklin Gutierrez will see improvement. First baseman Justin Smoak was terrible after coming over in a trade last year but, as a first-year player having to adapt to the big leagues while also adapting to a brand new organization, he can be forgiven for his poor performance. 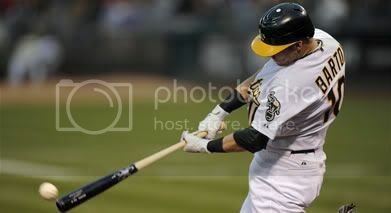 I expect him to at least get on base a little bit more this season. 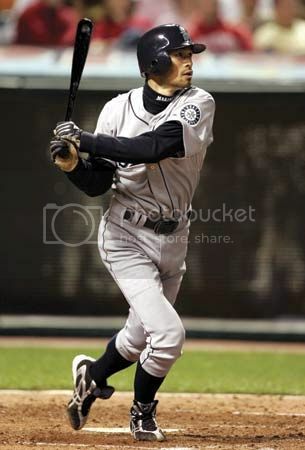 And, of course, the amazing Ichiro is a guarantee to knock 200 hits. The offense will be a little better but I actually think the pitching will be worse. Behind Cy Young award-winner Felix Hernandez, this rotation looks like crap. Rookie right-hander Michael Pineda ought to be fun to watch but this is also his first taste of the big leagues and so we don't know what to expect. With some regression on the mound balancing out the inevitable offensive improvement, I see them around 65 wins this year.